A bright antique finish candle holder with images of Tuscan landscape. Like a hurricane lamp, the tall glass lantern prevents sweeping curtains or wayward papers from coming into contact with the flame. 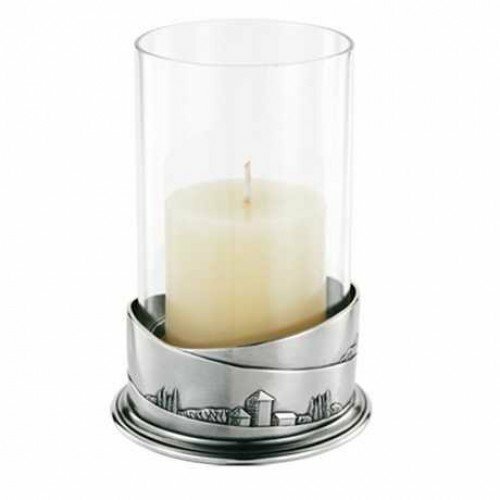 It also shields it from any breeze, making the candle holder perfect for both indoor and outdoor use. Since 1885, our designers and craftsmen have expressed their love and understanding of the material by continuously pushing the envelope in pewter design while staying true to our heritage of craftsmanship. Each Royal Selangor item is hand cast by pouring molten pewter into steel moulds quickly and efficiently. After cooling, each individual pewter piece is polished and soldered onto other appendages such as spouts and handles, all done by hand. This attention to detail and precision has made Royal Selangor's pewter pieces durable and timeless. Founded in 1885, Royal Selangor is the world's largest pewter maker. Our pewter consists of 92% to 97% tin - the highest international standard for pewter. Sleek or intricately detailed, our items fit seamlessly in classic or contemporary lifestyles. If you have any questions about this product by Royal Selangor, contact us by completing and submitting the form below. If you are looking for a specif part number, please include it with your message.